By Tom dePaolo Illustrated by Tom Swimm Can sudden fame and fortune replace the love and connection we have of our home? What is a platypus and what makes these creatures so unique in the animal kingdom? These questions and more are answered in this heartwarming story about a platypus that discovers that home is truly where the heart is. 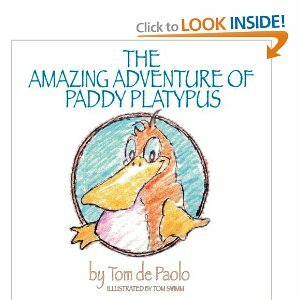 “The Amazing Adventure of Paddy Platypus” is the story of Paddy, the fastest swimmer on the island of Tasmania. He is so fast that Sir Hugh Tidybrooke, the head of the Department of Waterways, Foreign Affairs and Underground Railways convinces Paddy that he should go with him to the United States and enter the swimming championships in Los Angeles. Paddy wins all the races he enters but is frustrated with the hubbub of activity in the big city. He doesn’t enjoy his sudden fame - reporters harass him, bellboys try to take his traveling kit, and his life is turned upside down. In the final championship ocean race, he surprises everyone when he keeps on going and swims all the way home to Tasmania and peace. This is a great starter Chapter Book for your children to read, or for you to share together. The chapters are short, younger children can understand them, and this story is just the cutest thing! This is about a platypus called Paddy. He lives on an island just off of Australia called Tasmania. He can swim so fast! He is the fastest there is on Tasmania! I had to laugh when Sir Hugh Tidybrooke comes to find Paddy Platypus because he is pictured as a man wearing many hats! Well, he has many titles, as we all do today, and that is depicted in this book, giving me a good laugh! This is why I feel this book to be just as enjoyable for adults to read to their children as well as just the child reading it. So Sir Tidybrooke sees how fast Paddy can swim! Wow! He IS the fastest there is! He wants Paddy the Platypus to swim in California, in the United States, as he is sure he will win all of the races and be the fastest platypus there is! It's a long ways away from Tasmania. Paddy agrees to go, but he starts having second thoughts about doing so after he does compete! Oh, no! Sir Tidybrooke is worried! Paddy does show up for the last race, but he has other thoughts on his mind! He races in the race, but keeps on going! What? Yes! He swam ALL the way back home to Tasmania so he could be home! He is happiest at home, as we all are! This story proves that. Home is where the heart is, and Tasmania is Paddy's happy home! Again, this is a wonderful book for children to read! They will love this book! The illustrations are drawn and colorful, and cute. It is very much well worth the read, and well worth having in your home library for the kids, either in book format or even as the Kindle version. Both would be a great addition for your children! Now this is a book that should be winning the awards out there! HIGHLY recommended! There are also "2" sequels! They are: "Paddy the Platypus and the Ring Tail Squatteroo" and "Paddy Platypus Saves Beverly Bandicoot"! Grab those, too! ALL of these should be in your children's library! AND THE KINDLE EDITION IS BELOW - You cannot reach the Kindle version from this page. It's on a separate page and the link is below!